The Canis Panther is heavily muscled with a wide chest and jaw. Its ears are cropped and tail docked, and the rear dewclaws are removed. Its fur is short. 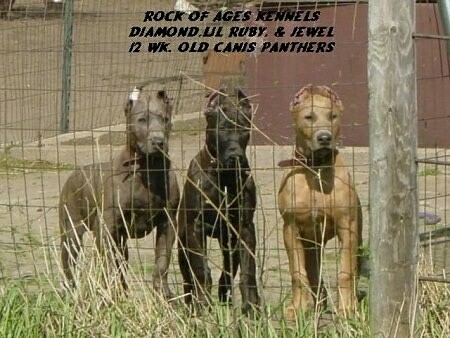 Colors include black, chocolate, fawn/buckskin, blue/gray. Canis Panthers are solid in color. The Canis Panther is a very sensitive and loving animal to its family pack. It is very intelligent, easy to train and extremely loyal. It excels in obedience, agility and personal protection and is a very good guard dog. It is very defensive of its territory and should be well-socialized, preferably when young with both dogs and people, especially with children, as the breed tends to be naturally wary of strangers, though he is very friendly with those he knows. In order to successfully keep a Canis Panther, the family must achieve pack leader status. It is a natural instinct for a dog to have an order in its pack. When we humans live with dogs, we become their pack. The entire pack cooperates under a single leader. Lines are clearly defined and rules are set. Because a dog communicates his displeasure with growling and eventually biting, all other humans MUST be higher up in the order than the dog. The humans must be the ones making the decisions, not the dogs. That is the only way your relationship with your dog can be a complete success. This breed must be kept inside because of its short fur. This breed must have a large area to run, and be taken on a daily, long walk. The Canis Panther was developed in the USA in the 1970s by Mr. Cleotha " Scorpio " Jones, Mr. Michael Stratten, and Mr. Lucas Lopez using the black Great Dane, black Labrador, Doberman Pinscher, and the Staffordshire Terrier. 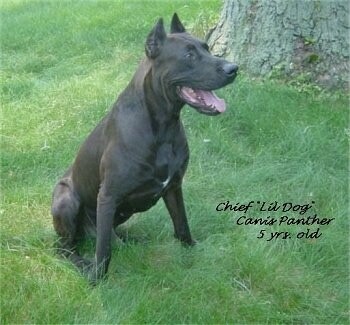 Today the Canis Panther breeds true. There are established bloodlines and multi-generation pedigrees.